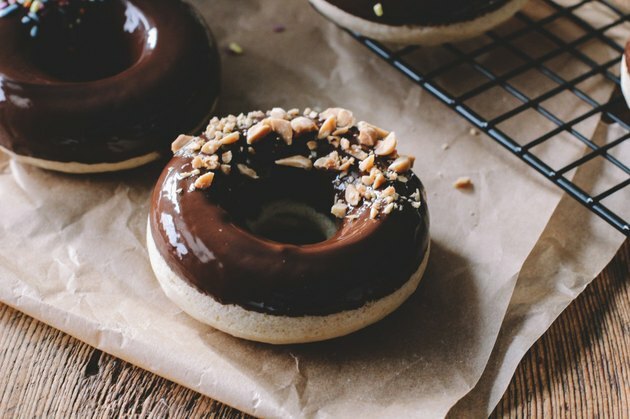 Whether you spell them doughnuts or _donuts_, I think we can all agree that the dough-y confections make for a mighty delicious treat any time of day. However, if I’m eating them first thing in the morning, I have two requirements: 1) they have to be baked, not fried and 2) they can’t be topped with an overly sweet frosting or glaze. The former has to do with the fact that I’ve never been a fan of starting my day with anything that’s been submerged in a vat of oil, but the latter is because I get a bad case of the shakes when I ingest too much caffeine and sugar, together—and I’m not about to give up my morning cup of joe for a tooth-achingly sweet doughnut. 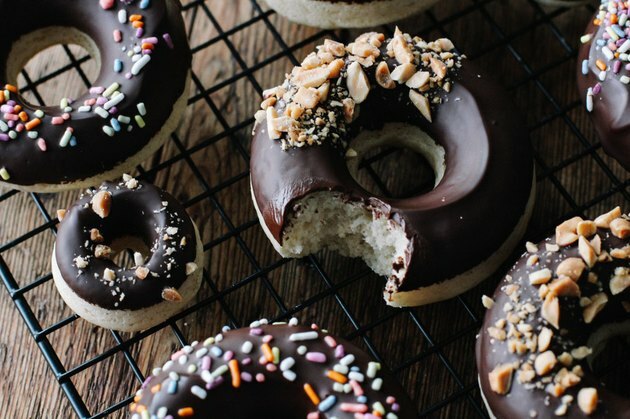 Instead, I baked these doughnuts so they’re not off limits for breakfast (turns out resisting a doughnut in the morning is not my strong suit). And then I topped them with an incredibly simple, chocolate glaze. Preheat oven to 350˚F. Line a drinking glass with a plastic bag that has 1/2 inch of the corner snipped; set aside. Lightly oil two doughnut pans (I used 1 regular and 1 mini) and set aside. In a large mixing bowl, sift together the flour, baking powder, salt, nutmeg, and cinnamon. In small mixing bowl, stir together the oil, sugar, vanilla extract, and milk (make sure it’s room temperature) then create a well in the dry ingredients and pour in the wet ingredients. Whisk just until combined. Scoop the dough into the prepared plastic bag then twist the end to make sure dough doesn’t come out the opposite end when you squeeze it. 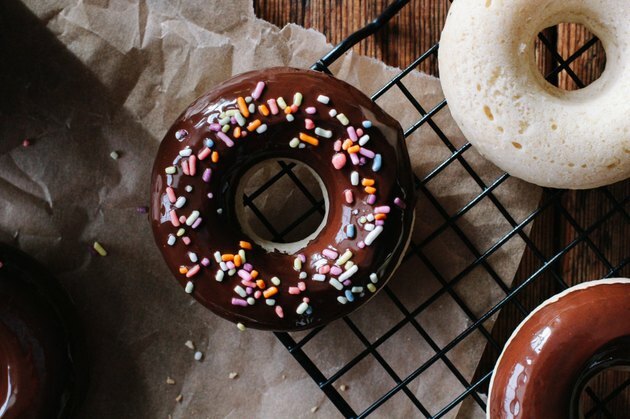 Use the piping bag to fill the doughnut cavities about 2/3 of the way full. Transfer pans to oven and bake at 350˚F for 13-14 minutes, then transfer to wire rack to cool. 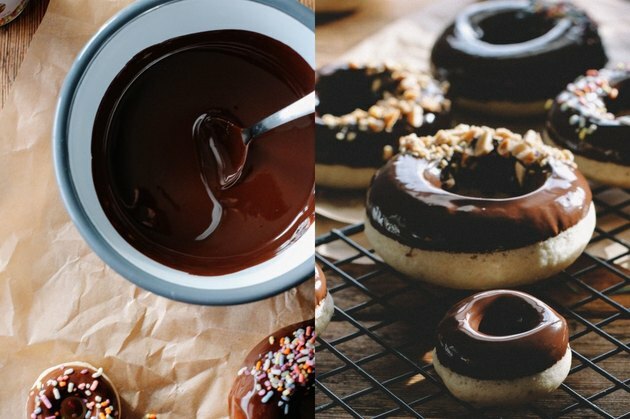 Prepare the glaze by melting the chocolate chips (you can use a double boiler or melt them in a microwave) and coconut oil. 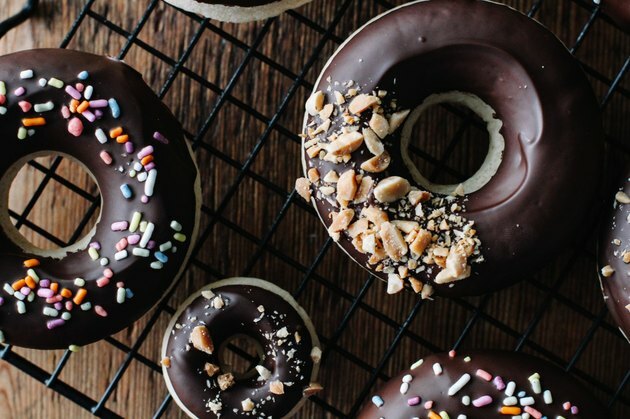 When doughnuts have finished cooling, dip each one into the glaze and finish with sprinkles, crushed nuts, shredded coconut, or your preferred doughnut topping. Transfer to refrigerator for 10 minutes to harden glaze. 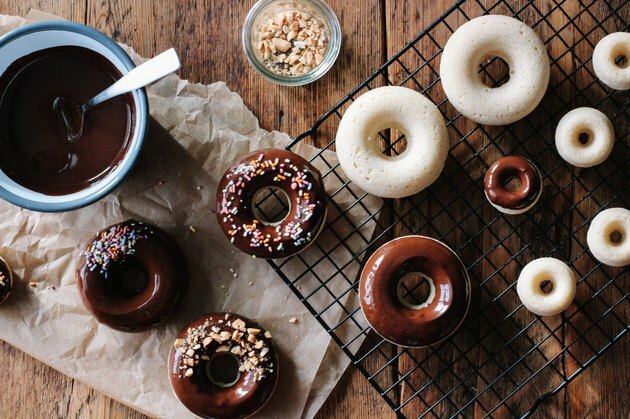 Doughnuts will keep in an air tight container for up to 3 days.